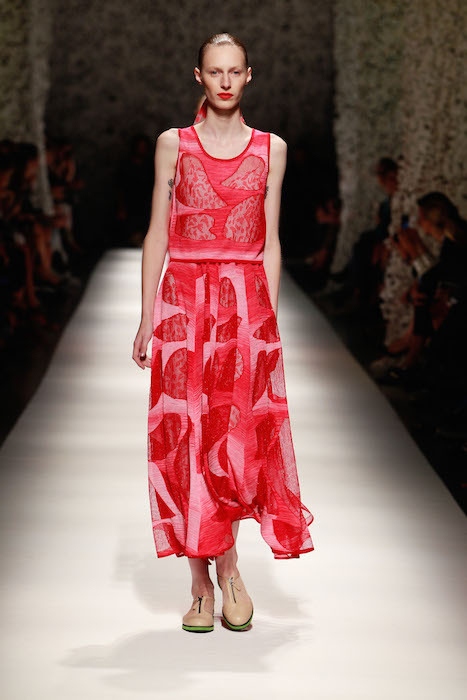 Breezy: Missoni spring 2015 at Milan Fashion Week gives us an airy, featherweight spirit with billowing fluid shapes. Lightweight knits with openwork and intarsia patterns get a touch of embroidery this season. Broad stripes softly blend with floating decoupé petals in matisse- inspired collages and sweet patterns in watercolors on hammered silk. A vacation-friendly summery landscape in pastel hues and fluo accents add to the multi color vibe of the collection. Sherbet – like Softened tones appeal in pastels with tones Ecrù, shades of pink, yellow, and greens and purple with hints of silver. Fresh and soft! Familiar faces walking include Yumi Lambert and Julia Nobis. MISSONI spring 2015 MFW commentary and selects by Brigitte Segura.